Orazio Luciano has an opportunity. It is expanding into the North American market at a time when Neapolitan tailoring is becoming increasingly popular, and other brands (most notably Kiton) are a fair bit more expensive. Orazio Luciano does classic Neapolitan tailoring: soft construction, shirt shoulders, curved pockets and a flair for colour and pattern. Indeed, its desire to brand itself as such is obvious by its tag line: La Vera Sartoria Napolitana. Americans like comfortable clothing, and the market has become more casual more quickly than almost anywhere else. Soft suits could fit right in. The make is extremely good. Hand finishing everywhere from the buttonholes to the double rows of edge stitching, plus parallel attention to detail inside. 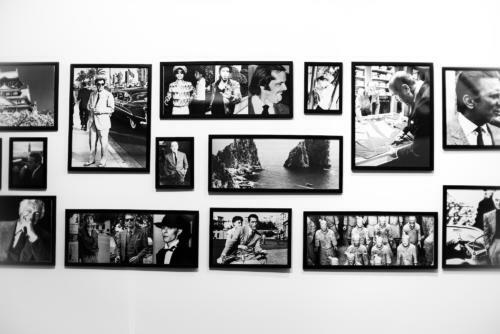 As you can see from the imagery here (taken at Pitti in June), the styles encompass a range from the conservative to the downright dandy. But like any collection many of the statement pieces – like the entirely unstructured white cotton suit shown below – are there to get people in to buy the navy suits. 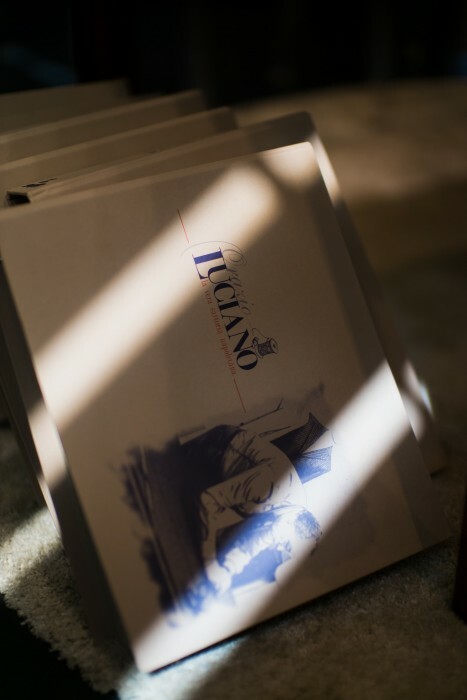 Orazio Luciano is stocked in Hong Kong and New York by The Armoury, in 5 Hazelton in Toronto, and in Artigiano in Miami. There are also outlets in Japan, China and – from November – Dubai. A suit is €3500 and made to measure starts from €4500. There is bespoke as well, but it’s not an immediate part of the expansion plan. There are too many existing bespoke customers and it’s too hard to scale. 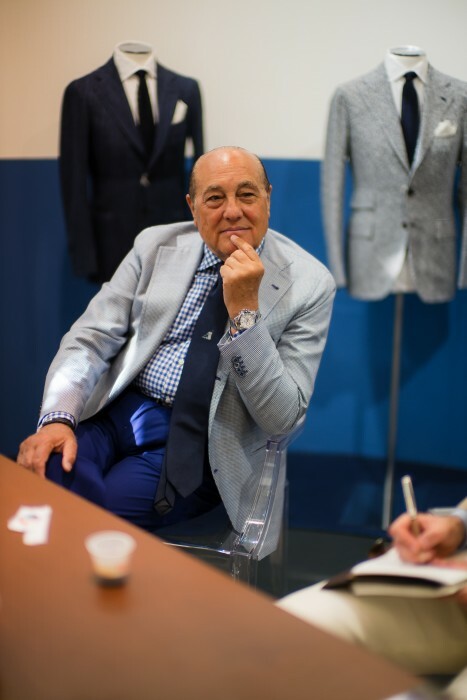 At some point, Pino (the son, and now the driving force behind the company) wants to buy an atelier next to the current one, dedicated to bespoke. But until that happens, and he has more time to travel, bespoke will be limited. You can follow the discussion on Orazio Luciano: expanding Neapolitan tailoring by entering your email address in the box below. You will then receive an email every time a new comment is added. These will also contain a link to a page where you can stop the alerts, and remove all of your related data from the site. V expensive! What justifies the price points? A small comment about your lovely jacket if I may: it seems to me that the cuff of the jacket are too big / wide. Is this deliberate? I guess this may be to accommodate a double cuff, but it still seems a bit on the wide side for me. I read somewhere that it was more common in the old days to cut odd jackets’ cuffs narrower as they would be worn only with barrel cuff shirts, and that seems to make sense. What do you think? Simon, I know you will have your reasons and I really am ready to be convinced but for the moment I have to agree with BB I’m afraid. 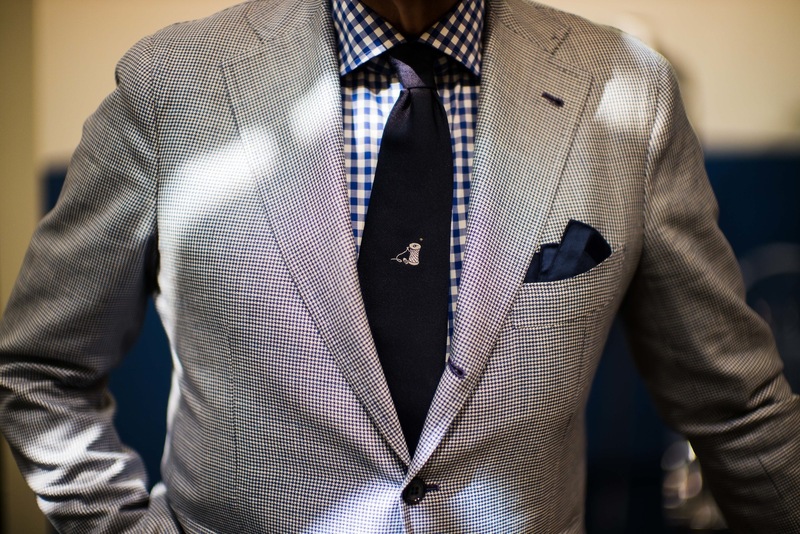 As much as I love your jacket, it seems something of a controversial step to design a causal linen jacket such that it might be worn with double cuffs when it seems likely to be largely worn with a single cuff and an excessive sleeve. It’s true. But then how much does it cost to get to Naples twice, and stay there? Launching a service that requires regular visits internationally is not cheap. Anyone who’s spending that kind of money on RTW or MTM needs their head testing! 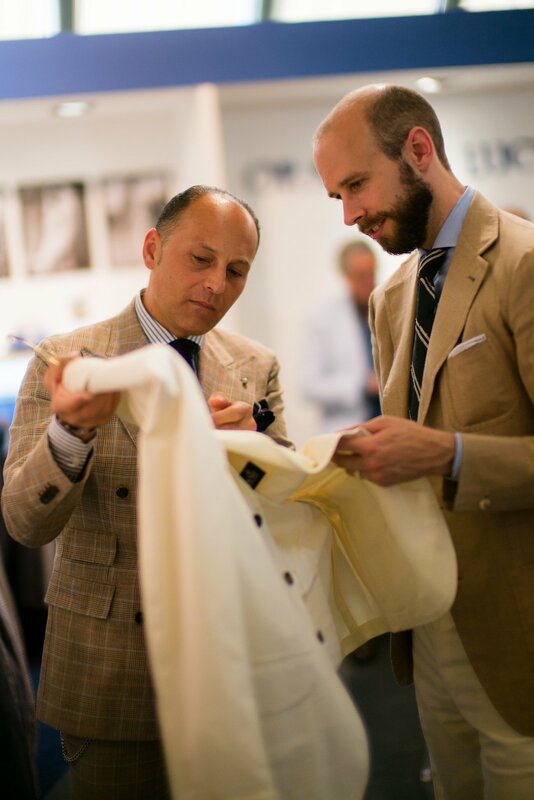 What about Sartoria Partenopea? There are not much information about them over there, the same for Sartorio and Stile Latino (Kiton and Attolini) I think they are on the same range as La Vera and have the same neapolitan roots. Hello Simon, could you please elaborate on the outlets you mentioned? Why does the brand have outlets (discounted shops) in Toyko and China? 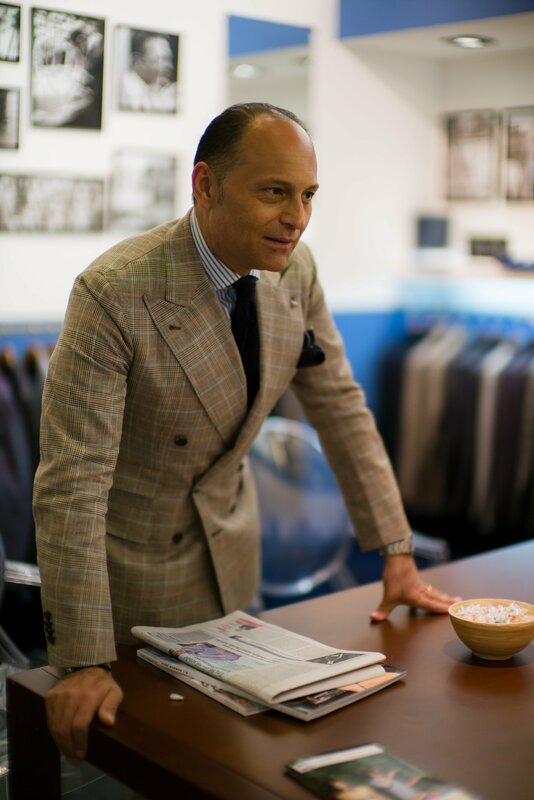 It seems that Jean-Manuel Moreau in Paris offers the MTM service from Orazio Luciano – for a price of EUR 1 600 for a 2 piece suit. I will contact them to check if this is still true. I am in NYC this week and I went to the Armoury on Duane Street – the price tag for RTW on Orazio Luciano is USD 3300 – and +10 to 15 % for MTM. Thanks Jerry. Yes, that’s right on The Armoury. MTM starts at $3500. I have been emailing Pino to get the prices confirmed – the problem is that the company’s strategy has changed quite a lot over the past few years and so has the pricing. I’ll let you know if those prices for the other shops in the US are incorrect. Jerry, I have had the prices confirmed by Pino. I received confirmation that the Paris offer for MTM starts at EUR 1800 (circ USD 2500) – which seems like very good value for money. I will probably try it in the fall. The Armoury offer seems great too for NYC – and the shop is a very good addition to the NYC landscape (Leffot, …). Thanks Jerry. I can’t help but feel that price in Paris will change at some point, if Pino is quoting €4500 for the US! That’s absolutely correct and it’s probably the lowest price retailer of Orazio Luciano MTM. When I told OGER guys about that, they went insane. He’s just making a lower margin than most others and accept it. Orazio’s new prices seem, to me, definitely not worth the money, sorry to say, despite the handwork. In addition, I do hope that for that kind of money, Orazio and Pino are aiming to improve the inside of the jacket which looks average at best (not talking about construction), just the sewing and seams of the lining and the pockets. The price for RTW is borderline outrageous at 1’000 EUR more than Sartoria Partenopea. That being said, I’m sure they have well thought about their business case and know what their clients are ready to pay. Sorry to see that they’re thinking about Russians a bit too much maybe. Your photos remind me that gingham check is this year’s french blue. There are a lot of things in the price – Orazio is more of a brand, does a lot more design time and work, exhibits at shows, etc etc. It’s the same reasons most bespoke is better value than most RTW or MTM. Any idea if Orazio canvass is hand- or machine- padded? Thank you! Orazio is currently having a 70% off sale on their online store. Thank you for your article about La vera. On day 12, today, there will be a MTM trunk show in here, S.Korea and I am scheduled to meet Pino at 17:00. I had a bunch of Qs prepared to him but now deleted several of it since there already many released writings and comments, reviews about this brand and items. How would you compare Orazio Luciano with Saman Amel Napoli line? They are approximately at the same price and both in napolitan style?